Rainforest Challenge which was held annually has promoted Malaysia in the eye of 4x4 enthusiasts around the globe to experience the challenge in their 4x4 in Malaysia's rain forest. This tough event require the participants to equip their self with skills,experience as well as team spirit. Most important is whether your 4x4 are really ready for world class 4x4 challenge. 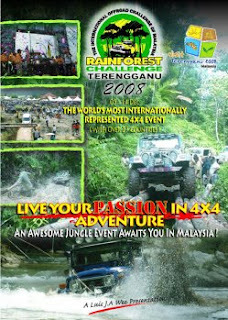 This year, Malaysia will be again hosting another Rain forest Challenge 2008 and the venue has planned to be same venue as last year 2007. Last year challenge has become a very tough challenge for off roaders where there were only less than 10 4WD managed to complete challenge.This year event is expected to attract more participants around the world as they have unfinished business last year. 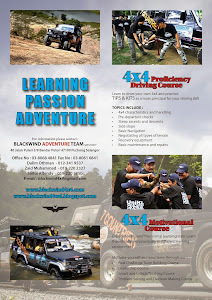 Planned between 5th to 14 December 2008, for those 4WD enthusiast can visitRainforest Challenge for further info. As a reminder, the challenge will really test your courage, spirit and most important your skills and experience.